AMs, teachers and community leaders will be at the event organised by the Ahmadiyya Muslim Association. The Amhadiyya Muslim community in Cardiff is calling for communities to work together to fight radicalisationMuslims are gathering for a peace conference in Cardiff on Saturday in the wake of the Paris attacks and ongoing crisis in Syria.Speakers at the Stop the CRISIS event include Welsh Conservative leader, Andrew RT Davies , Newport AM Mohammad Asghar , Caerphilly AM J eff Cuthbert and Monmouth AM Nick Ramsay.Head teachers and religious education teachers, representatives from community organisations and charity workers will be among delegates said the Cardiff Ahmadiyya Muslim Association which is organising the event at the Park Inn Hotel, Llanedeyrn. 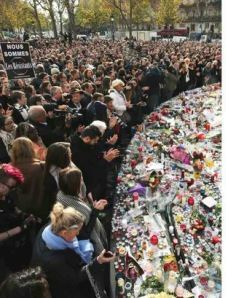 In a statement the association said: “The brutal nature of the Paris attacks has shocked and appalled everyone.“We condemn these attacks and all forms of extremism and terrorism.“With the motto ‘Love for All, Hatred for None’ the Ahmadiyya Muslim Association continues to promote understanding and tolerance in order to build a healthy and harmonious society.“We feel there is a great need to explore ways in bringing people closer in an attempt to address issues such as radicalisation, terrorism and islamophobia.”Delegates from other faiths have also been invited to discuss ways to bring communities together said spokeswoman Saiha Maaz. Organiser Saiha Maaz said: “Islam’s true message is that of peace and harmony. Our fundamental values are freedom, liberty, equality, justice and respect. These values are under threat by the forces of extremism.”Wales has to respond to this threat. We must unite against all forms of extremism- Muslim radicalisation as well as Islamophobia. The forces of extremism are seeking to divide us. We can make our streets safer by joining hands regardless of race, colour or faithand by celebrating our multi faith diversity and freedom of religion.”Also speaking at the event will be Muhammad Noman, regional president Ahmadiyya Muslim Association, South West and Dr Shakeel Ahmed from the external affairs team of the Ahmadiyya Muslim Association UK. Share the post "Muslims to gather in Cardiff for peace conference in wake of Paris attacks and crisis in Syria"